I have never been one to follow the crowd and my wedding will be no different. In middle school and high school I wore the biggest, baggiest boy jeans I could find and rocked all sorts of funky colors in my hair. Not much has changed since then aside from the pants, which have been replaced by more form-fitting jeans. My fiancé Mike fell in love with me because of my laid-back demeanor and unique style, so he knew what he was getting himself into. 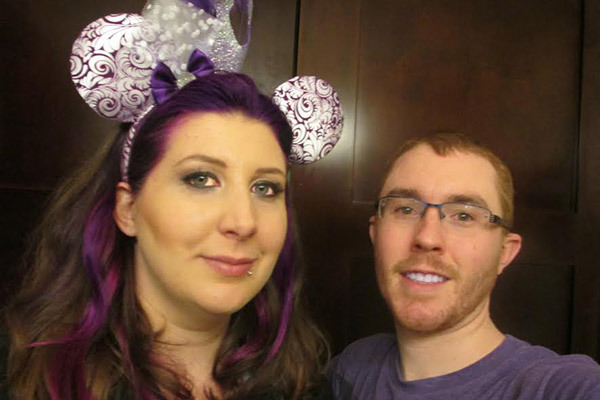 We're getting married at Disney World’s Wedding Pavilion in Orlando, Florida on Halloween and our wedding colors are purple and black. In December, we're going to have a masquerade ball-themed reception back home in Grand Rapids, Michigan since a lot of our extended family and friends won't be able to attend our destination wedding. The kicker: My dress is purple! Mike hasn't batted an eye at any of this — he was previously married and went the traditional route already, so he has no problem trying something different this time around. Halloween is our favorite holiday so when I told him I thought it would be fun to get married on that date, he was very excited about it. 1. Let your freak flag fly! By that, I mean do what suits you as a couple, not what suits others. If you're hesitant to go full speed ahead with a crazy-unique theme, then include elements that are more subtle. We considered doing a costume party at first but then Mike and I came up with the idea of throwing a masquerade ball. (I've always loved the masquerade scenes in Labyrinth and Phantom of the Opera.) We thought this would be a fun and whimsical way to incorporate our personalities without the wedding having an overwhelming Halloween feel — especially since the reception isn't until December. And let's not forget about my beautiful purple dress. I have never been one to wear white (ever!) and I never envisioned myself in a white dress on my wedding day. 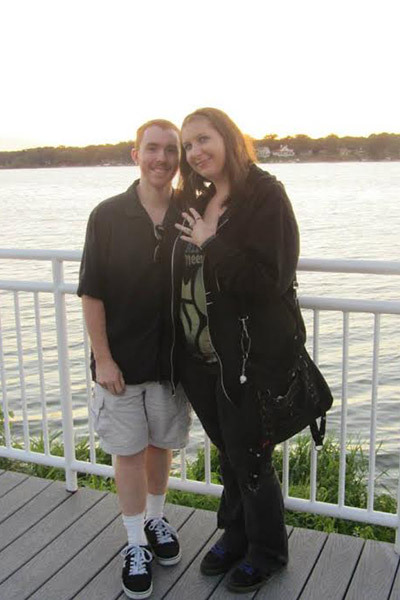 In fact, I never really thought about my wedding at all until I made a trip to New York City for a concert in 2010. I saw a bride and groom heading to Central Park to take pictures and the bride's dress was bright pink. In that moment, I realized that my dress didn't have to fit the stereotypical bridal mold: it could be whatever color I wanted it to be. I felt so relieved and excited! 2. Accept that not everyone will be on board with your idea. There will be some naysayers who probably won't "get it," and that's OK, because your big day is about celebrating you and your fiancé. Regardless of what ideas you have for your wedding day, it’s really important that you talk about the details that are important to you that may be a little strange. You won't always be together when people comment on them, so a united front is always the best way to go. For example, Mike and I have gotten flack for using black as a dominant color since most people don't associate it with weddings. But black doesn't always have a gothic, scary feel to it; our vision is actually a lot more romantic and less haunted house, which is what most people tend to assume. Right now, my mom and I are trying to compromise on the amount of black involved in the ceremony. The room we're getting married in is almost completely white and our floral arrangements are purple so she's having a difficult time seeing where we could include more black elements. Another point of contention has been deciding what we want to do with our last names. Traditionally, the bride takes the groom's last name and that's that. I have been trying to imagine not having my maiden name anymore and I'm just not sure that's something I can do without. Being a Wellman is a big part of who I am and even though I know that will never change, the feminist in me just doesn't think it's fair for me to have to change my name. So, right now my fiancé and I are considering hyphenating our last names as a compromise. We haven't talked to either of our families about it since we haven't made a firm decision yet, but I imagine it will go a lot like that scene from Father of the Bride. 3. Defend your decisions as a team. This is where the united front comes in because people will challenge you along the way. Every time my mom and I went dress shopping it was a struggle because the consultants had me try on numerous white dresses to try and get me to change my mind. Or they would say things like, "Use a purple ribbon to lace up the corset and then you'll have your pop of color." That's wonderful advice for someone who wants a pop of color, but even after I said that wasn't what I wanted, they had trouble accepting that. When I told an acquaintance that Mike and I were getting married on Halloween, she immediately exclaimed, "You're not going to wear a black dress, are you?!?!?!" To which I replied, "Actually, in all honesty, I'm looking for a purple or black dress." She gasped loudly as I continued with the line that my fiancé and I had prepared for responses like hers: "When have you ever known me to be traditional? This really shouldn’t be that surprising." People will try to warn you that you’ll regret your unique decisions when you look back on your pictures years from now. When this happens, I have to remind myself that my idea of beauty isn't what most people see as beautiful. I've had quite a few people try to talk me out of dying purple streaks in my hair for the wedding and I know my mom will try to convince me not to wear my lip ring on the day of our ceremony. I've dealt with the "this isn't normal for society" discussion more than I would like in my lifetime, so this isn't really new to me. The most important thing is that I’m staying true to myself and who I am — that’s all the explanation I usually give. If you’re planning a destination wedding like I am, then you should expect some hurt feelings from people who aren't invited or can't go. Some of them may try to change your mind but don't confuse this with resentment as most of them are actually just trying to look out for you. It's best to explain the reasons why you chose to have a destination wedding rather than take their well-intentioned advice as an insult. Our solution for this is streaming our big day online. We know it's not the same as being there in person but it will be in real time so at least we won't have to wait until we get our video back for them to enjoy our day. The only person who hasn’t given me any sort of grief about any of this is my fiancé. Not only does he have similar tastes in style but he has also never tried to change me. Just like a good chunk of men, Mike isn’t involved in most aspects of the wedding but only because he’s not interested in those types of things. I still seek his input and guidance on a lot of things because I’m a strong believer that this is about us, not just me. He has been extremely supportive of our vision since day one. My mom, despite being a little heartbroken about the dress not being white, has been amazing about accepting our vision. Actually, both of our families and friends have not only accepted the non-traditional aspects of our wedding but have embraced it with open arms. My bridesmaids have even offered to dye their hair! 5. Venders will love working with you! When we had a consultation with our florist and we explained our theme to her, she practically begged for us to pick her because she was excited to do something different. She was even enthusiastic about our color scheme, which surprised us. Our venue coordinator in Michigan was just as happy to host a unique event, especially since the space screams masquerade ball. Not to mention the woman who will be doing my hair in Florida gave me tips on where she thought my purple streaks should go to best accentuate my wedding-day look. What I'm getting at here is that wedding industry professionals love to work with non-traditional couples because it allows them to be more creative with their work. Let their creative juices flow and they might even come up with something you hadn't thought of! Don't be afraid to reach out to online outlets if you can't find what you're looking for locally — some of my best ideas have come from the Internet. Not everything about our wedding is non-traditional (not that there’s anything wrong with a completely non-traditional wedding). We plan to do the whole slew of meaningful dances at our reception and are currently discussing how we want our unity candle ceremony to go — we will, of course, be putting our own spin on it. We’re also trying to figure out what my "something old," "something borrowed" and "something blue" will be. Mike will wear a black tuxedo and our bridal party will be in traditional attire complete with mini bouquets and boutonnieres. Keeping all that in mind, our wedding isn’t outrageously non-traditional but that doesn’t mean people will refrain from being judgmental and unpleasant (even if it’s unintentional). We just want our celebration to be a reflection of who we are. Our biggest concern is whether or not we’re being true to ourselves and having fun throughout the process. Doing something unique is always a risk but what’s life without a little risk-taking here and there? Whatever you do, traditional or otherwise, this is the only time you get to design a party just for the two of you.